Molly Ayer has one last chance, and she knows it. Close to being kicked out of her foster home -- just months from turning 18 and “aging out” of the system -- Molly should be grateful that her boyfriend found her a community service project: helping an old lady clean out her home. Molly can’t help but think that the 50 hours will be tedious, but at least they’ll keep her out of juvie, and right now that’s all she cares about. Ninety-one-year-old Vivian Daly has lived a quiet life on the coast of Maine for decades. But in her attic, hidden in trunks, are keys to a turbulent past. 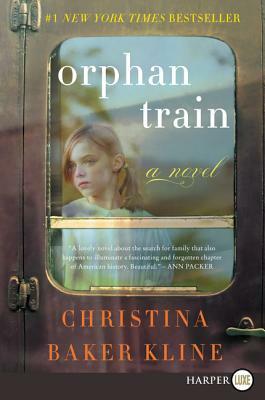 Molly is about to discover -- as she and Vivian unpack her possessions, and memories -- that Vivian’s story is a piece of America’s tumultuous history now largely forgotten: the tale of a young Irish immigrant, orphaned in New York City and put on a train to the Midwest with hundreds of other orphaned children whose destiny would be determined by luck and chance. As Molly digs deeper, she finds surprising parallels in her own experience as a Penobscot Indian and Vivian’s story -- and Molly realizes that she has the power to help Vivian find answers to mysteries that have haunted her for her entire life. Rich in detail and epic in scope, THE TRAIN RIDER is a powerful novel of upheaval and resilience, of second chances, of unexpected friendships, and of the secrets we carry with us that keep us from finding out who we are.